Xi Jinping’s visit to Moscow presents a unique opportunity for both nations. Checkout the latest photos from the summit. With China’s new President Xi Jinping visiting Russia for his first state visit, the world is watching. What agreements could be signed? What new partnerships may be formed? Both states have a clear interest in creating stronger ties. From area such as defense technology, energy, and matters of national security and foreign policy, Moscow and Beijing in many respects have similar interests. Can such ties stand the test of time? As China’s economy grows ever larger and its military becomes even more powerful, will Russia feel pressure to change course? The Diplomat presents some of the more unique photos from the talks in Moscow. Please let us know your thoughts on this important summit. 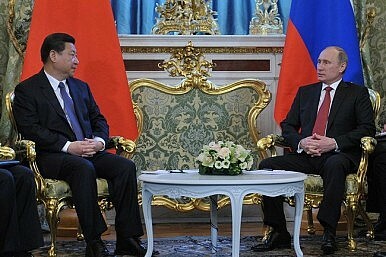 Can Russia and China’s partnership endure? Ties that Bind: Can China-Russia Relations Endure? With Xi Jinping in Russia, Moscow and Beijing’s interests overlap on more issues than is often realized.